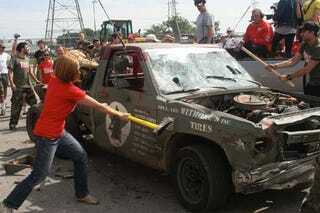 In Toledo, Team First Blood GMC Sonoma Takes People's Choice... And People's Curse! I asked LeMons official and Ecurie Ecrappe member TheEastBayKid to explain why First Blood got the Curse, and he couldn't say. Was it the no-doubt-terrible handling and extra wheels flying through competitors' windshields? Were the drivers suffering from Nam Flashback hallucinations that made all the other cars look like Ho Chi Minh's Peugeot 404, and driving accordingly? (Ed. - It was the driving, they stayed in the middle of the track making it impossible to pass their slower truck. They would also sit low on the track wait for a car to pass on the outside, then edge/push the car into the cones, a black flaggable offense for the outside car. Their driving was sneaky, conservative and annoying, a brilliant combination to get through 24 hours, but also one that'll get everyone else red-assed - Ben) We can't say, but we have no problem seeing the reasons for giving them the People's Choice trophy- just look at that thing! Race organizers were presented with something of a dilemma when it came to choosing the means of destruction for the Curse ceremony, since utter annihilation by earthmover seemed too harsh under the circumstances; the Sonoma had just blown up its engine on the track, so the "brick on gas pedal" method was out. Fortunately, the First Blood team itself volunteered to smash the living hell out of the truck using axes and sledgehammers, and then the track guys broke out the Jaws Of Life to finish the job. Good work, First Blood!